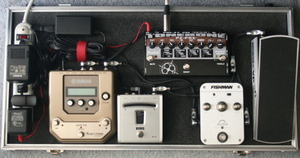 I’m loving the sound of this pedalboard! The Tonebone PZ-Pre put the the final touch on the overall sound quality, but I think the Fishman Aura (Nylon String) and the Yamaha Magicstomp Acoustic are equally important to the tones I’m getting now. And I have zero complaints about the Ernie Ball VP Jr. or the Korg DT-10 tuner. Everything is working perfectly!